"The aim of the HERGA Conference series is to bring together colleagues from the higher education sector to discuss best practice and new approaches to teaching in the tertiary environment. Every year, we see academics, from across South Australia and interstate, come together to listen to inspiring Keynote speakers about the most current and forward thinking practices in Higher Education. We listen to often thought-provoking presentations from a range of academics, from across a variety of disciplines on challenges and engaging practices in Higher Education. These presentations and the keynote speakers often ignite rich discussion among academics during the breaks. 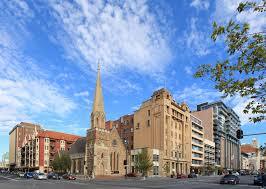 Each year our conference is held in the beautiful city of Adelaide. Adelaide is surrounded by parklands and is situated beside the Torrens river. Adelaide has easy access to beaches (a 30 minute drive from the city) and has a whole range of shops, cafes and restaurants in the city or in the surrounding suburbs. 2016: "From Research and Policy into Practice"
2015: "Brave New World: The Future of Teaching and Learning"
2014: "Changing Horizons: Local Learning for Global Impact"
2013: "From Bricks to Bytes"
To find out about this year's theme, please visit our 2015 conference web page.